VUONTISJÄRVI, Kati and JERNDAHL, Tuija (2017) Reading together! – ebooks for school use. Paper presented at: IFLA WLIC 2017 – Wrocław, Poland – Libraries. Solidarity. Society. in Session 112 - Poster Sessions. Rovaniemi City Library had a project piloting supplementary e-reading material for schools in the Lapland region in 2016. The project was called Sähköinen oheislukemisto Lapissa and it answered to the needs to have more co-operation between libraries and schools and also to push e-reading and e-books for students. The project goals were to increase e-reading skills and co-operation between libraries and schools, to offer more easily available collection of e-books by piloting the supplementary e-books collection for school use. Rovaniemi City Library co-operated with publishing house Otava, e-book provider Ellibs and the schools of the area. The funding was allocated from the Ministry of Culture and Education via Administration Agency of Lapland. The project was active only for a short period from September to December in 2016 because of the small funding. The project started with discussions with Otava and teachers about the collection and with Ellibs about the platform and e-book licenses. We had ten e-books in our pilot collection, six interested teachers and 113 students participating the project. They tested e-reading by using their own devices and at the end gave us also feedback. The teachers loved supplementary e-books because it freed student to choose one more way to read. They felt that especially weaker student were motivated by e-reading. Teachers also liked easier accessibility. 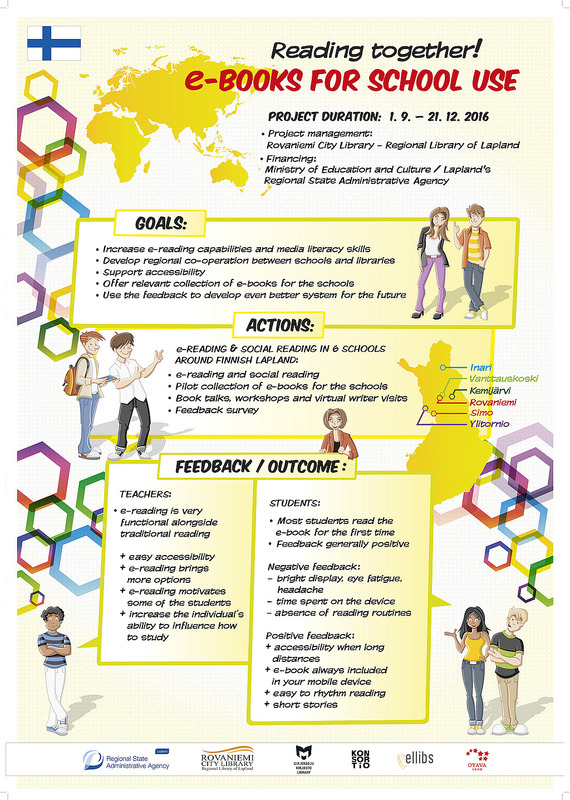 Most students liked e-reading despite the fact that they were unfamiliar with e-books prior to the project. They found e-books easy to use and liked the idea that e-books were always with them. Negative feedback was connected to eye fatigue or time spent with devices. During this autumn we are opening our supplementary e-book collection for all the schools in Lapland. We hope that teachers and student will find it as easy and comfortable to use as our piloting participants.